There are a few select It girls who shall never be toppled from their thrones—think Kate Moss, Sienna Miller or, more recently, the Hadid sisters—but as each year comes around, a fresh crop of faces are ripe for the picking, being wooed by fashion designers, snapped up by agencies and booked for magazine shoots. Whether rockstar or runway goddess, celebrity offspring or out-of-nowhere celebutante, the time has come for us to offer some predictions on 2017's It girls who are in the making. Whether sending shockwaves through Instagram, garnering interest as the awards season nominations start to trickle in or suddenly appearing on the front row of a Chanel show, there are many ways one can deduce who the next big names are going to be in the most stylish echelons of showbiz. Some of the names listed below may be easily recognisable, however, our crystal ball can forsee 2017 as the turning point for many from kind-of famous into magazine-cover famous. Style Notes: With one of the most feted stylists in town behind her (Rebecca Corbin Murray, who works with Emma Watson and Jenna Coleman amongst many others), is it any wonder this Argentine former-Disney star is now on our radar? Style Notes: Bel Powley wowed us all on last year's BAFTA red carpet in rainbow lamé Gucci and has been throwing some adventurous sartorial shapes ever since. You'll know her for that incredible turn in The Diary of a Teenage Girl, but there are four movies under her belt for 2017. So watch this space. Style Notes: Cindy Crawford's daughter is—gasp—only 15 and already notching up more modelling gigs than we've had hot dinners. She's signed to IMG and has already been on the cover of Pop, included in Interview's "new wave" feature and scooped up a Marc Jacobs's beauty campaign. Not bad, huh? Style Notes: If you've watched the U.S. sitcom Black-ish, you'll know 16-year-old American actress Yara. She's already a young but powerful force in speaking out about diversity in the industries of acting and fashion. Plus, she's into studying biochemistry. Brains, beauty, talent… The words "fast trajectory" should cover it. 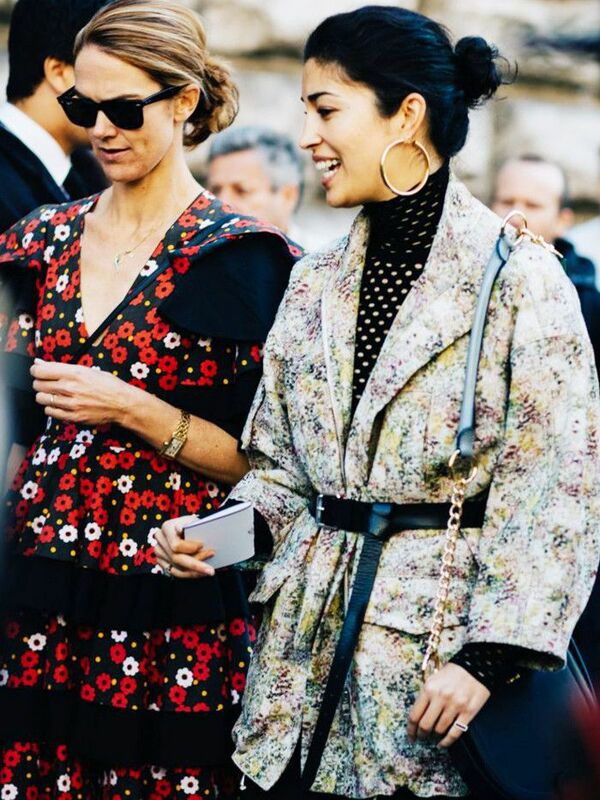 Style Notes: Fashion editors know these two from way back—the twin sisters used to attend the shows for their mother's Saudi boutique when they were only children. But you will have perhaps seen more of these two recently: They DJ (as Simi & Haze) at every cool party under the sun and socialise with the likes of Willow Smith, Hailey Baldwin and Selena Gomez. Style Notes: She's the British Victoria's Secret Fashion Show model you don't know… yet. The blonde bombshell is also a Guess girl (another very big job) and has been on set for international editions of Elle, Vogue and Madame Figaro. Style Notes: We've all known about the daughter of Courtney Love and the late Kurt Cobain, but when she turns up on the Chanel FROW, you pay even more attention. We won't be surprised if a makeup campaign or a deal is just around the corner—she has one of the most authentic new beauty looks on the block. Style Notes: One could argue that 2016 has been the year of Lily-Rose Depp, but we have a feeling even more major happenings are on the horizon. Magazine covers are coming in thick and fast, plus a 2017 film role alongside her father is whizzing around the rumour mill. Style Notes: With the starring role in the hugely hyped new release, Loving, we don't think Ruth is going to fly under-the-radar much longer. She's already nominated for a Golden Globe, so we're sure some jaw-dropping red carpet looks are being cooked up as we type. Style Notes: With her shaved head and her relatively out-there dress sense, Halsey is easy to spot in a crowd. Her recent AMAs debut performance was dubbed as "flawless" and Halsey's video for her 2015 track "Gasoline" featured none other than Gigi Hadid. She's a long way from her early years posting cover songs on YouTube. Style Notes: Unless you've been stuck under a rock, you'll know that everyone was obsessed with another girl with another buzzcut last year: Eleven in TV smash Stranger Things. Millie Bobby Brown was the lucky young thing who secured this role and has since been thrust into the fashion limelight—there's apparently a Louis Vuitton/Stranger Things project in the works. Style Notes: As the official significant other to our nation's fair Prince Harry, we're going to be seeing a lot more of Meghan's fashion choices in the wider media. We've already been keen on the actress's glossy uptown look, and if you are too, check out her lifestyle site, The Tig. Having just bagged a Louis Vuitton campaign (following in the footsteps of Alicia Vikander and Jaden Smith), this 21-year-old American actress is tipped for big things, especially after a standout debut performance in 2016 film American Honey. Style Notes: Hadid-mania continues, branching out through the family tree to Bella and Gigi's half sister, Alana. She's a super-chic personal shopper and stylist, and you can read all of the reasons we think she's cool here. Style Notes: She's the pocket-size, blue-eyed 22-year-old model everybody watched closely during Yeezy's Season 4 show because she's reportedly Kanye's muse. On another note, Carine Roitfeld is also a fan. Style Notes: The surname rings a bell, right? The 20-year-old daughter of the legendary film director Steven Spielberg has recently launched her modelling career, bagging a slot on the books of a Hollywood agency called DT Model Management. She's already on Dior's invite list, and we wouldn't be surprised if a swimwear campaign soon came calling. Next up, this week's hottest shopping picks.